It's funny how life seems to throw co-incidences at you. Until recently I'd never given the small island of Gibraltar any real thought. Then the company I work for expanded their services there which meant I needed to learn about this unusual British overseas territory. A few weeks later the monumental car-crash that is Brexit reached it's Article 50 moment and Gibraltar hit the news. Not least as Spain took the opportunity to suggest they should claim it back - it's been British ruled since 1713 following the War of the Spanish Succession and subsequent Treaty of Utrecht. It's also one of the most densely populated and affluent territories in the world. The following day I picked up From Darkest Skies which begins on Gibraltar, albeit a Gibraltar some time in the future. In this future Spain isn't just off the coast anymore, having been wiped out over a century previous by a mysterious alien race known simply as the Masters. The Masters changed the face of the planet, altered humanities destiny and scattered them to the stars. Then they just disappeared, leaving behind advanced technology that people could use but little understood. Keon Rause is getting ready to leave Gibraltar and Earth after a five year secondment following the death of his wife. He is to return to his home world of Magenta, resuming his career with the Magentan Intelligence Service. He takes with him an artificial recreation of his wife's personality (known as Liss and entirely illegal) built from every digital trace she had left behind. This artifical personality has been created with the express purpose of finding the truth behind his wife's murder. His real motive for returning to Magenta is to work with Liss and piece together his wife's last days. There is a lot more to the story than this but I'd rather not mention any more as it's worth finding out for yourselves. I liked the author's writing from the start, not least in his depiction of the protagonist. He captures Rause's loss perfectly, even after five years emotions are raw and Rause cannot think of anything else - largely of course due to the creation of Liss (and the circumstances surrounding her death) - the grieving process often requires distance from constant reminders - how is one able to grieve if always in communication with an artificial construct of the person who died. I, like many, have lost loved ones and the author manages to encapsulate how one does (or does not) deal with such a situation. The author provides brief backstory without resorting to exposition or lengthy dialogue. The story is compelling and the authors voice clear and friendly. It's also creative and clever, having the pace and style of a thriller but with the imagination and ideas of the best science fiction stories. As with all the finest thrillers, the story is complex and intriguing, it keeps you on your toes and makes you eager to see where it goes next. 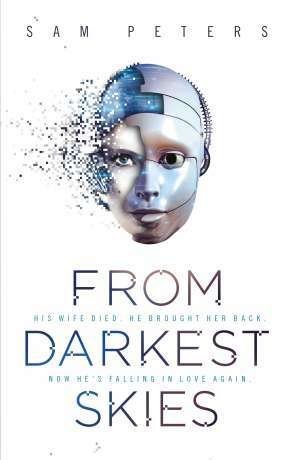 Not only does the book explore the loss of a loved one, it's also a dialogue on human interaction with AI, exploring how an individual could become emotionally attached to an artificial construct. I recommend this book to anyone, From Darkest Skies is accessible, fast and fluid, compelling and above all thoroughly enjoyable. Written on 18th April 2017 by Ant.